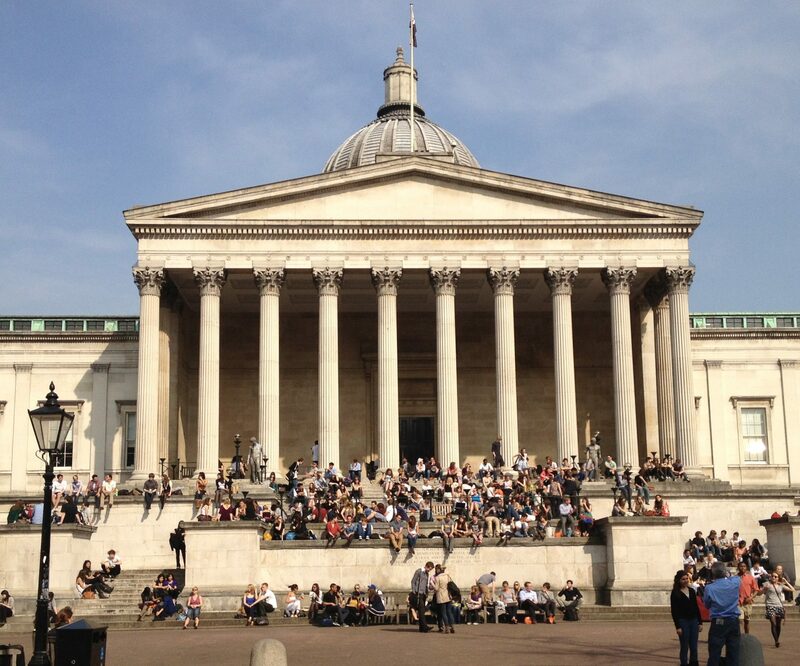 University College London (UCL) is usually ranked within the top 30 academic institutions worldwide, and ranked 4th (worldwide) in the 2009 League Table of the Times Higher-Education Supplement. 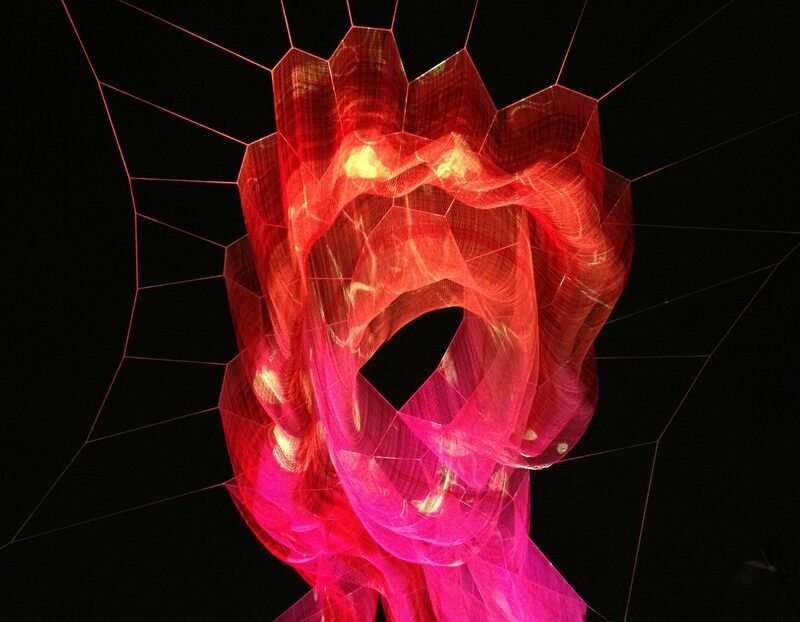 The London Centre for Nanotechnology (LCN) is a joint enterprise between UCL and Imperial College. The Physics Department is the largest within the Mathematics Astronomy and Physical Sciences (MAPS) faculty, with approximately 80 permanent staff members. Both departments (LCN, Physics) lively interact in a synergistic manner to give rise to a research and teaching environment of exceptional intellectual vibrancy and cross-fertilisation in fundamental science, technology transfer, and teaching/training. Topics covered span from magnetic monopoles to nanotechnology-enabled early detection systems for epidemics, to quantum computing and organic (nano)electronics. Prof. Cacialli is head of the Organic semiconductors and Nanostructures group at UCL. He works on organic semiconductors and related applications (light-emitting and photovoltaic diodes, field-effect transistors). He is a member of both the LCN and the Department of Physics and Astronomy at UCL. He obtained his PhD from the University of Pisa and later worked in Cambridge as a post-doctoral fellow. He moved to UCL in 2001. Franco coordinated a EU-funded Marie Curie Research Training Network Threadmill, co-authored the book “Functional Supramolecular Architectures” (Wiley – 2010), and is a Royal Society Wolfson Research Merit Award holder. Andrea was previously an ESR in Prof. Cacialli’s group, carrying out research focused on organic semiconductors for NIR optoelectronic applications funded by the Marie Curie Innovative Training Network OSNIRO. Giuseppe works on the fabrication and optical characterization of photonic structures. Tecla works on the investigation of fundamental optical properties of supramolecularly engineered materials incorporating photonic crystals. Alexandros works on growth and characterization of photonic structures with functional defects. IIT Center for Nanoscience and Technology is part of the Istituto Italiano di Tecnologia (IIT). The center operates at the forefront of science and technology of nanomaterials for optoelectronics, focusing on applications in the fields of photovoltaic conversion, photodetection, and biomimetic systems. It is a national stronghold contributing to the development of the high-tech industry of Italy. The Center is linked to Politecnico di Milano, National center (ULTRAS-INFM) and European Large Scale Infrastructure for ultrafast science. Prof. Lanzani has 25-years experience in photophysics of conjugated carbon materials, has > 200 publications in high rate journals, more than 80 invited talks at international conferences and institutions, 8 review chapters in books and 3 books as editor. He is leading the Center for Nanoscience and Technology. Dr. Petrozza is a scientist at the Center for Nanoscience and Technology since January 2010. Her research is focused on the characterization of photovoltaic devices and their active components by time-resolved and continuous wave optical spectroscopy, vibrational spectroscopy and electrical measurements. She got her PhD in Physics at the University of Cambridge in 2008, then She gained experience in R&D on DSSC in industry at Sharp Laboratory of Europe Ltd form 2008 to 2010. Prof. Scotognella is assistant professor in Physics at Politecnico di Milano and affiliated to the IIT. He is currently studying the photophysics of nanostructures and organic materials and the optical properties of photonic structures. Stefanie works on the characterization of the optical properties of photonic devices. Giuseppe works on ultrafast dynamics and fundamental photophysics. UNI-CYUniversity of Cyprus (UNI-CY) is a new University and the first to be established in Cyprus (1989). In its short existence it has expanded to 6 Faculties and 21 Departments, with the Department of Chemistry sustaining one of the largest PhD programs, attracting both European and National funding exceeding 8.5 M Euros. UCY runs a Jean Monnet Centre of Excellence, as a proof of its dedication in European integration teaching and it has an UNESCO Chair for Equality and Gender Empowerment. The specific role within SYNCHRONICS will be the Resonance Raman and Inverse Raman spectroscopy of supramolecular assemblies for application in all-optical switching. Prof. Hayes is the director of the Molecular Spectroscopy Laboratory in the Chemistry Department of UNI-CY. Her expertise is in Molecular Spectroscopy, especially Ultrafast Spectroscopy (pump-probe techniques), Resonance Raman, and time-resolved photoluminescence spectroscopy, and non-linear optics, applied to various chemical systems, including organic semiconductors. Current research interests involve understanding of the fundamental photophysics of organic semiconductors through combination of Resonance Raman and optical spectroscopies. Elisa works on Resonance Raman Spectroscopy and Inverse Raman spectroscopy investigations of supramolecularly engineered materials. The Institut de Science et d’Ingénierie Supramoléculaires (ISIS) is a top research institute of the Université de Strasbourg (UdS), founded by Prof. J.-M. Lehn (Nobel Laureate in chemistry), directed by Prof. T.W. Ebbesen in the period 2005-2011 and since January 2012 by Prof. Paolo Samorì. The institute is composed of academic labs and satellite labs of private institutions, thereby offering an ideal playground for knowledge transfer from academia to industry and intersectoral environment for training and research. The specific role in SYNCHRONICS will be the surface and morphological characterisation of the devices using a suite of scanning probe microscopy techniques, as well as the tuning of the energetics by means of photoelectron spectroscopies. These information will be essential to the design and performance of the devices prepared. Marco works on multiscale morphological, compositional, electronic and electrical characterization of hybrid structures. University of Genova (UNI-GE) is a long time established University with a good ranking among Italian Universities. The department of Chemistry and Industrial Chemistry (DCCI) sustains Master programmes in Chemical Sciences, Industrial Chemistry and Material Science and Engineering. Moreover, the Department manage the PhD School in Science and Technology of the Chemistry and of Materials where five PhD courses are activated (Chemical Sciences and Technologies; Pharmaceutical, Food and Cosmetics Sciences; Materials Science and Technologies; Nanochemistry; Drug Discovery). The Department attracts National, International and Industrial founding. The specific role within SYNCHRONICS will be the preparation and characterization (structural and spectroscopic) of 1, 2 and 3D all-polymer and hybrid photonic crystals (PhC). Moreover, it will be involved in the preparation of hybrid noble-metal-nanoparticles fluorophore dyads, polymer matrices with controlled refractive index and gas permeability, block-copolymers self-assembly as well as quantum chemical calculations of isolated and clustered conjugated systems. Prof. Comoretto leads the Organic & Polymer Photonics group of the Chemistry and Industrial Chemistry Department at UNI-GE and will supervise the growth and optical investigations of organic and hybrid photonic crystals as well as all related materials science items. He has more than 20-year experience in Molecular Spectroscopy and Photonics, especially in the photophysics of conjugated polymers, spectroscopy of highly oriented and strongly anisotropic conjugated polymers, artificial opals, self-assembled microsphere monolayers and all-polymer microcavities. 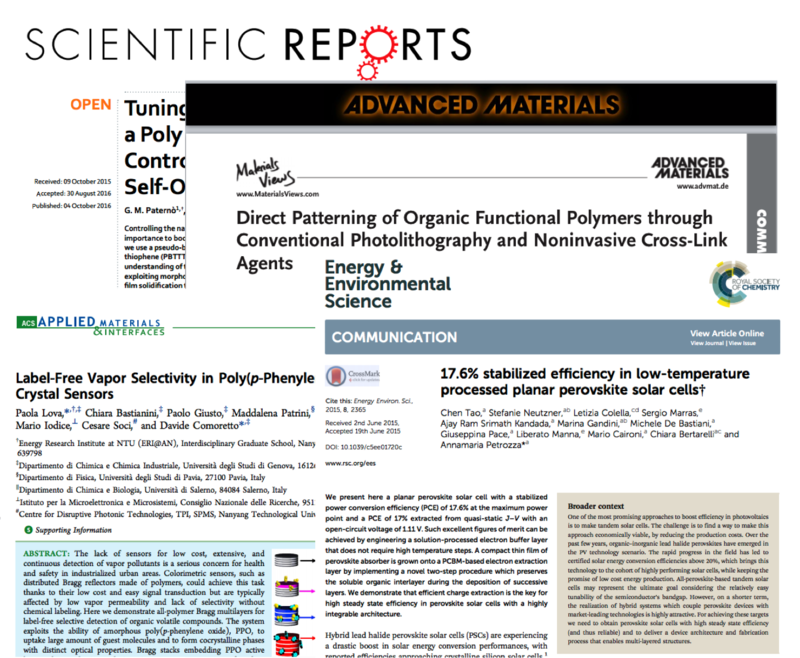 Current research interests involve the preparation of organic & polymer photonic crystals having different dimensionality and their use for lasing, sensing and photovoltaics. He is co-author of more than 120 publications and of 3 pending patent requests. Paola works on polymer and hybrid photonic structures. Surflay is a german research company founded 2008 in Berlin by Lars Dähne. The company has 13 employees, 12 of them are scientists in chemistry, physics and biochemistry. Surflay is developing so-called Layer-by-Layer (LbL)-solutions for industrial applications. In the project SYNCHRONICS Surflay will synthesize polyelectrolytes with specific functions (e.g. fluorescent, conductive) and will assemble them in thin layers with nanometer precision either on planar surfaces or on monodisperse spherical particles or inside of mesoporous materials. In addition, the implementation of nanoparticles, like gold, magnetite, quantum dots or TiO2 in LbL-films will be exploited for the preparation of well defined supramolecular assemblies with new functionalities. Dr. Dähne is the CEO of Surflay. During his habilitation at the FU Berlin he worked on supramolecular dye assemblies and their extraordinary optical properties. After his habilitation 1998 he went to the Max Planck Institute of Colloids and Interfaces (Germany, Potsdam/Golm) and started the work on polyelectrolytes. In the group of Prof. H. Möhwald he co-developed the (LbL)-coating technology on spherical particles. In 2001 he co-founded the Capsulution Nanoscience AG and in 2008 the Surflay Nanotec GmbH. In both companies he continued his work on encapsulation strategies of different objects and their photophysical modification by means of the LbL technology and his experiences on dye assemblies. He is still docent on the FU Berlin, supervised several bachelor, master and PhD students and is author of more than 70 publications in international peer-reviewed journals. Aline works on the preparation of thin functional films on planar and spherical resonators by LbL-technology. The Department of Chemistry at Oxford is world-leading, with around 80 academics carrying out international-level research published in the highest quality journals, and an annual research income of about £17 M. It has produced four Nobel laureates. Prof. Anderson is head of the Molecular Engineering Group. The group has an international reputation for the design, synthesis and testing of functional organic molecules. Areas of expertise include organic synthesis, supramolecular chemistry, physical organic chemistry, photochemistry and photophysics. The group specialises in the investigation of photoactive molecules, dyes and extended π-systems. Sabine works on encapsulated π-systems for efficient luminescence at visible wavelengths. Lara works on supramolecular materials with efficient near-infrared photoluminescence. University of Pisa (UNI-PI), funded in 1343, is one of oldest and prestigious Universities in Europe. University of Pisa ranks 1st in Italy, together with The University of Rome “La Sapienza”, according to the prestigious Academic Ranking of World Universities (www.shanghairanking.com) formulated by the “Jiao Tong” University of Shanghai for 2013. University of Pisa ranks in the 101°-150° category worldwide. According to QS World University Rankings by Subject 2013, University of Pisa ranks 24 in the word in Physics and in the top 200 Universities in 12 further disciplines, among which electrical and electronic engineering. The Information Engineering Department (IED) of UNI-PI (90 Faculty and Staff members) pursues research work in the fields of Electronics, Computer Engineering, Telecommunications, Bioengineering, and Robotics. The Department has over 25 laboratories, some of which equipped with microelectronic and microfabrication technology facilities and device/system characterization systems. The specific role within SYNCHRONICS will be the fabrication of photonic feedback structures (1D, 2D, 3D) and integration with the functional materials, as well as device integration and characterisation. Prof. Barillaro is the leader of the MicroNanoSensors Group at the IED of UNI-PI. Professor of Electronics (since 2005) at the University of Pisa, senior member of IEEE (since 2005) and ECS (since 2005), and MRS member (since 2012). He has 10-year experience in fabrication, integration and characterisation of silicon-based sensors, photonic devices and microsystems. Valentina works on the incorporation of supramolecularly-engineered materials into PC-Si chips. The University of Würzburg is one of the oldest German universities (founded 600 years ago) and has 25.000 enrolled students in 2012. Since 2006 the PhD training in Science and Technology is organized within the Graduate School of Science and Technology (GSST). In addition the Faculty of Chemistry has (since 2007) a DFG-funded research training school GRK 1221 “Control of electronic properties of aggregates of π-conjugated molecules” and (since 2012) a DFG-funded Research Unit FOR 1809 on “Light-induced processes in molecular assemblies” which offer a programme of lectures and seminars to all enrolled PhD students working at the interface between materials chemistry, optical spectroscopy and quantum chemistry. Prof. Würthner is the chairman of the Institute of Organic Chemistry and the director of the Centre for Nanosystems Chemistry. He leads the Organic Materials and Nanosystems Chemistry group. He has a 10-year experience as full professor and served as dean from 2007 to 2009. His research is in organic/supramolecular chemistry with focus on functional dyes and materials for organic electronics and photonics. Current projects are in the field of dye assemblies for organic electronics, photovoltaics and photonics. Here perylene bisimide dyes play an important role owing to their superb fluorescence and semiconductor properties. Prof. Würthner has pioneered the self-assembly of these dyes into various functional architectures and elucidated the conformational properties of core-substituted derivatives. He has been the first to report the excimer-type emission arising in columnar stacks of perylene bisimide dyes. Furthermore he could realize J-aggregates of perylene bisimide dyes by involvement of hydrogen bonding which afforded the first dye assemblies with fluorescence quantum yields close to unity. Vincenzo works on H-bond J-aggregates for high solid-state photoluminescence. AMO GmbH is a German SME with 40 employees specializing in R&D for micro- and optoelectronic applications. AMO’s mission is to develop innovative technologies for nanoelectronics and nanophotonics and their implementation in novel devices architectures to a prototype level. The resultant devices and subsystems are exploited by AMO as a low volume foundry or transferred to a key player in the field. Since 1997 AMO employs one of the leading European research groups in UV- and soft UV nanoimprinting. AMO is furthermore active in research in integrated nanophotonics for communication, plasmonics and life science applications. Dr. Wahlbrink got his Diploma and PhD in Physics at the University of Osnabruck (2001). He is a senior research scientist at AMO GmbH (2001-today). He conducted research on nanoscaled transistor devices and fabrication processes for integrated silicon photonic devices. He is heading the e-beam lithography group at AMO and worked in several national and European founded projects. Furthermore he coordinated the FP6 project “Circles of Light” and is author or co-author of several publications of advanced processing for integrated optic devices. Dr. Giesecke obtained a diploma from Leibniz University in Hannover, Germany and her doctoral degree in physics from Heinrich-Heine University in Düsseldorf, Germany. She joined AMO GmbH in 2013 and is group leader of the nanophotonics group. Her research experience are laser sources in the infrared wavelength range, integrated silicon photonics, laser and plasma physics. Piotr works on top-down 2D photonic structures. IBM Zurich is the European branch of the IBM Research Division with headquarters at the T.J. Watson Research Center in NY, USA. At the IBM Zurich Research Lab a broad spectrum of research activities in the field of photonics and opto-electronics is pursued. IBM ZRL provides a state-of-the-art infrastructure with a variety of facilities to tackle such an interdisciplinary project. The main topic of the Exploratory Photonics group is the investigation, both experimentally and theoretically of new photonic structures and materials for optical data communication technology with special emphasis on the investigation of the fundamental physics of confined optical systems and hybrid nanostructures. Dr. Mahrt received his PhD working in the field of site-selective laser spectroscopy in disordered systems in 1991 from Marburg University. He was a research associate at ”Istituto di Spettroscopia Molecolare”, CNR, Bologna in 1996. He obtained his habilitation in physical chemistry in 1997 on ultrafast laser spectroscopy. In 1999, he was appointed to a group-leader position at the Max-Plank Institute. In 2001 he joined the IBM Zurich Research Laboratory (ZRL). His current research interests are opto-electronic properties of organic/inorganic materials, optical properties of confined systems, and more recently optics of organic/ inorganic hybrid systems in photonic band gap structures. Fabio works on amplifiers, lasers and optical switches. Prof. Silva’s research activity is focussed on interfacial properties (from thermodynamics to electronic) of interfaces that present a complex later structuring (mainly for mixed molecular systems with a contrast in wetting and/or conjugation). His group, Laboratoire pour l’étude de matériaux de pointe par spectroscopie ultrarapide, spans from synthesis of nanomaterials, to self-assembly of these surfaces, to characterization with scanning probe and other methods.